The 2019 Sun Life Walk to Cure Diabetes for JDRF brings together over 35,000 Canadians from coast to coast to raise $4 million to accelerate the pace of type 1 diabetes (T1D) research. We want you to be a part of this movement! Rally with us to help create a world without T1D. Together, we will continue to fund the brightest minds in T1D research and help turn type one into type none. Reminder: Your Fundraising Page will remain open until the end of the year - so you can continue to collect pledges and submit them up until December 31, 2019! Interested in participating in this year's Walk? Click here to register today! A new diagnosis of type 1 diabetes (T1D) can trigger a range of reactions, including anger, sadness, and guilt. Whatever your feelings, they are normal and you are not alone. Life with T1D can pose challenges for every member of the family. Whether you have T1D yourself, are the parent or loved one of an individual with T1D, it takes time to adapt to the day-to-day demands of diabetes. Treatment options are improving all the time, and T1D does not need to prevent you, your child, or loved one from living a full and active life. As time goes by, everyone will gain knowledge, confidence, and be able to celebrate successes, learn from mistakes, and move away from the intense feelings that are common after diagnosis. Until there is a cure, we want to provide information that will help you cope with the burdens that T1D can impose, and take advantage of the help that is presently available. 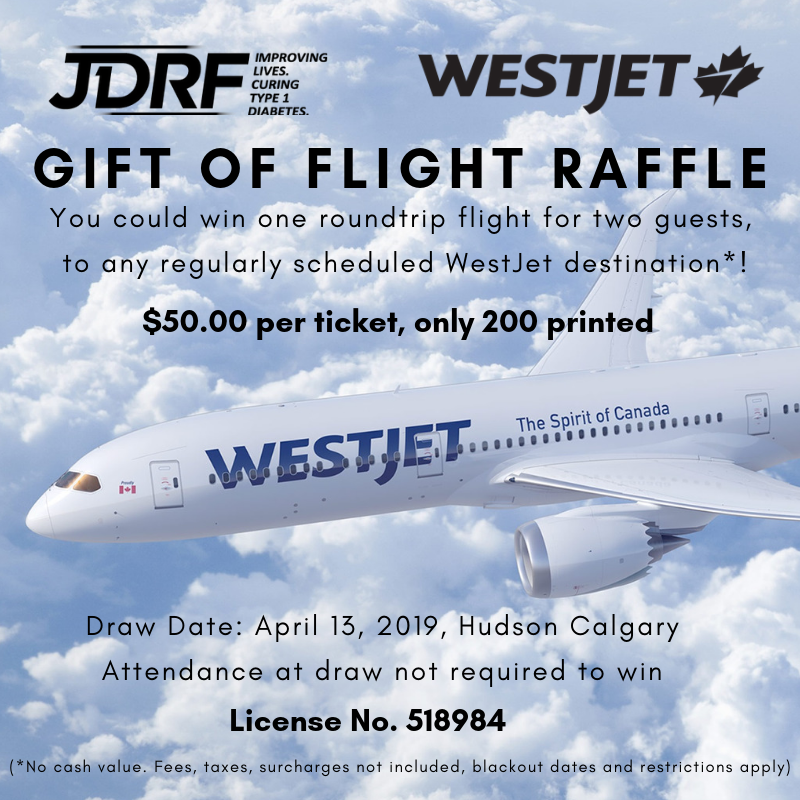 For more information please contact us at calgary@jdrf.ca. JDRF’s Bag of Hope program is a free resource which provides information and support to families with children who are newly diagnosed with T1D. The Bag of Hope is filled with relevant diabetes education materials and supportive materials. If your child is 12 years or younger, you will also receive a Rufus Bear. This bear with diabetes is designed to help little ones cope and learn about insulin injections. In addition to the Bag of Hope, you will automatically receive JDRF's newsletter to keep you abreast of JDRF’s efforts to find a cure for diabetes and its complications through the support of research. You can request your Bag of Hope by clicking here. TrialNet is an international consortium dedicated to advancing the science of prevention and early treatment to preserve residual insulin secretion in type 1 diabetes (T1D). Natural History Studies are being conducted to learn more about what causes T1D and to find out what might predict the development of the disease. These studies provide close monitoring to individuals "at risk" for developing T1D. Individuals at greater risk may be offered an opportunity to participate in a prevention study. Screening involves a simple blood test to look for diabetes-related autoantibodies that may appear years before T1D develops. Relatives of individuals with T1D have an approximate 3% - 4% chance of having autoantibodies in their blood associated with T1D. We encourage you to participate in the study if you are able. For eligibility and more information, please visit: www.diabetestrialnet.org. Through our mentorship program, families and individuals touched by diabetes can be paired with a trained mentor – someone who has experienced the challenges of being newly diagnosed. Family Mentors can provide information about diabetes resources and educate families about what they can do to help find a cure. Our mentorship program is free of charge and membership never expires! Please note: our team can only share their personal experiences with you. We are not health care professionals and are unable to provide medical advice. The information provided by our team is not intended to take the place of medical advice, for which you should consult your doctor or other health care professionals. For more information, please contact Katie Von Hansen or 403-255-7100. We are always looking for good people to help with a variety of fundraising events and office assistance! If you are interested in volunteering with JDRF please contact our office at calgary@jdrf.ca or 403-255-7100. Donate A Car Canada accepts vehicle donations for the JDRF Canada. We provide free towing in many areas across Canada, or you can drop off your vehicle to maximize your donation. When you donate you RV, boat, motorcycle, or other vehicle to JDRF through Donate A Car Canada, it will either be recycled, or sold at auction depending on its condition, age, and location. Donate A Car Canada will look after all the details to make it easy for your charity to benefit. After your vehicle donation is complete, JDRF will send you a tax receipt within 45 days. For more information please contact calgary@jdrf.ca or 403-255-7100. Honour someone you love or remember someone you miss by supporting the vital research needed to find a cure for T1D and its complications. Cards will be sent to next of kin or honoree with your personalized message. Do you have extra or unneeded insulin, test strips, or syringes? Consider donating them to Insulin for Life - a not-for-profit organization that distributes diabetes supplies to developing countries in need. JDRF Calgary is an official drop off location for your unneeded supplies. Donations can be made at JDRF's office anytime Monday to Friday from 8:30am to 5:00pm. For more information visit Insulin for Life or contact our office at 403-255-7100. Are you ready to organize your own fundraising event for JDRF or simply have a creative idea in mind? We'd love to hear from you. JDRF is grateful for the support of many individuals, schools, and workplaces who organize their own independent fundraisers.